Wesley Holton worked in Daniel Boulud’s kitchens in New York City and Palm Beach, Florida, before becoming executive chef at the Daniel Boulud Brasserie in the famed Wynn Las Vegas hotel. But since that high-end French restaurant closed earlier this year, Holton has a new gig: making tacos in Detroit’s first food truck! And while the Daniel Boulud Brasserie offered caviar, $43 steak au poivre, and a $32 hamburger with foie gras and short ribs, Holton’s new menu offers short ribs in a $2.50 taco, served with warm corn tortillas, fresh black bean & corn salsa queso fresco, and sauce vért. 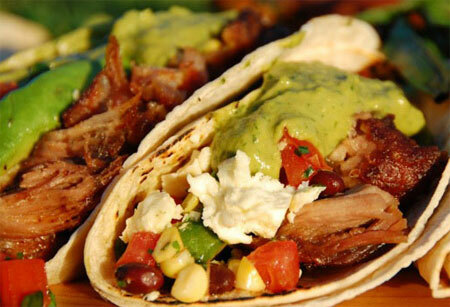 Other ‘high-end’ items include little piggy slow-roasted pork tacos and marinated avocado tacos at $2.50 apiece. GAYOT.com features Detroit restaurant reviews, the best restaurants in the Motor City in a number of categories, as well as Grand Rapids restaurant reviews.